To be perfectly honest, I’ve never gone on a cruise where I didn’t gain a few pounds. I have to admit that it’s easy for me to go on a cruise with good intentions, and then get totally sidetracked. I always go on a cruise intending to use the gym, and determined to avoid most carbs. But…then I get lazy and see chocolate melting cake on the menu and there go all my good intentions. So, how can you realistically limit the weight you gain, or gain no weight at all? You have to be determined! 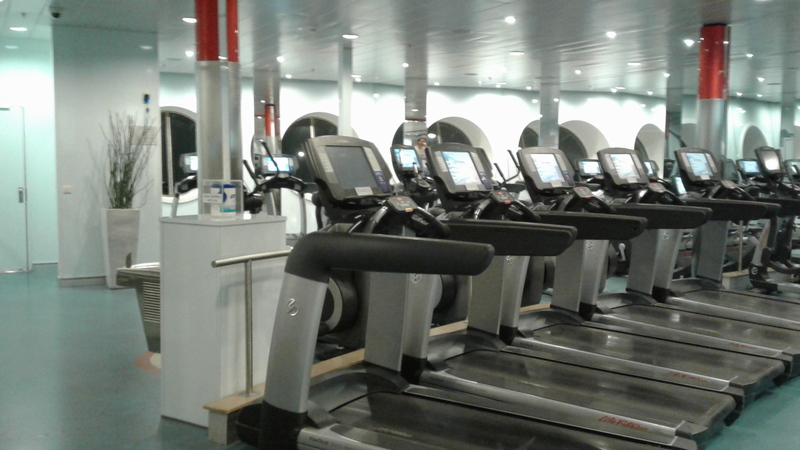 It can be done, there are many opportunities for exercise on a cruise. And you can avoid the carbs and sugary snacks…If you are determined and have lots of will power. But how? First thing to know is that it’s easy to get exercise on a ship. First off you have a completely furnished gym that anyone can use, it’s included in your cruise fare. They also have yoga and other exercise classes, but they will cost extra. So, if you want to avoid the weight gain, pack your exercise clothing, and go to the gym every day. They have all sorts of exercise machines, including weights, treadmills and elliptical machines, and they come with a beautiful view. The ship will also have a track of some sort that you can run on. Usually it’s towards the top deck of the ship. You can also walk on the track, or you can walk on the outside promenade deck. Some ships have promenade decks that go all the way around the ship, some don’t, but usually you can find a way to walk entirely around the ship. And as a bonus, you get a great view of the ocean. Plus, there’s plenty of walking on the ship just exploring, and you can incorporate walking into your port stops or take an excursion that has walking or other calorie burning activities on it. Swimming is another way to burn calories, and if you like to snorkel, that’s plenty of exercise. 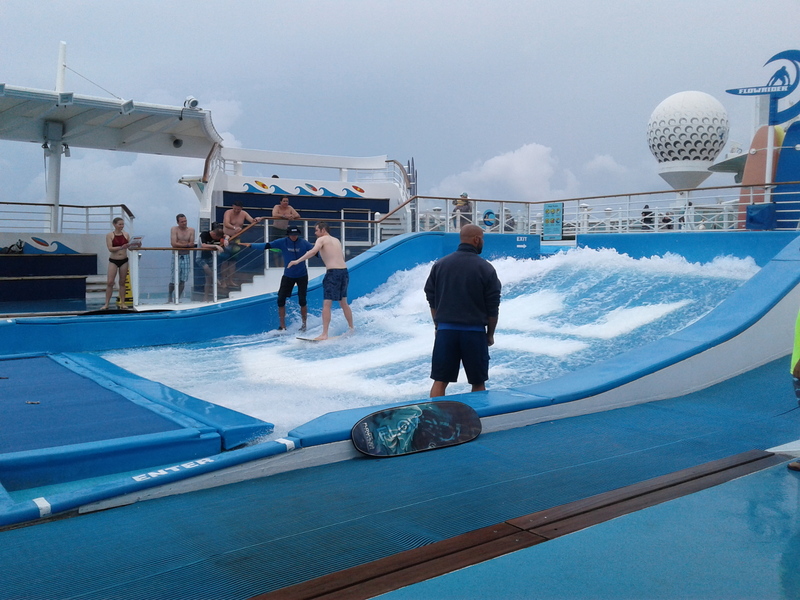 Plus, some ships have rock climbing walls, Flowriders, Rope Courses, and other opportunities to burn calories. Take advantage of them! What we try to do to limit the amount of weight we gain is to use the steps instead of the elevators. The elevators are always so crowded anyway that it’s much easier to use the stairways because they’re not normally so crowded. You’re going to find stairways right by every set of elevators. It’s great exercise! And don’t forget about joining in on the line dancing when you get the chance. That’s lots of fun! What about the food? Well, that’s the hardest part. 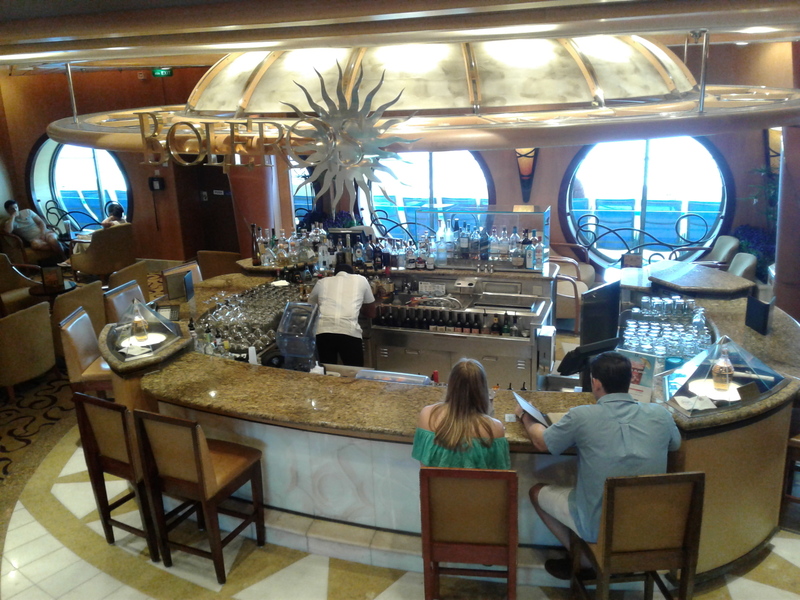 There is so much food on a cruise ship, and it’s around all the time. So this is where you need willpower. It’s perfectly possible to eat healthy on a cruise. 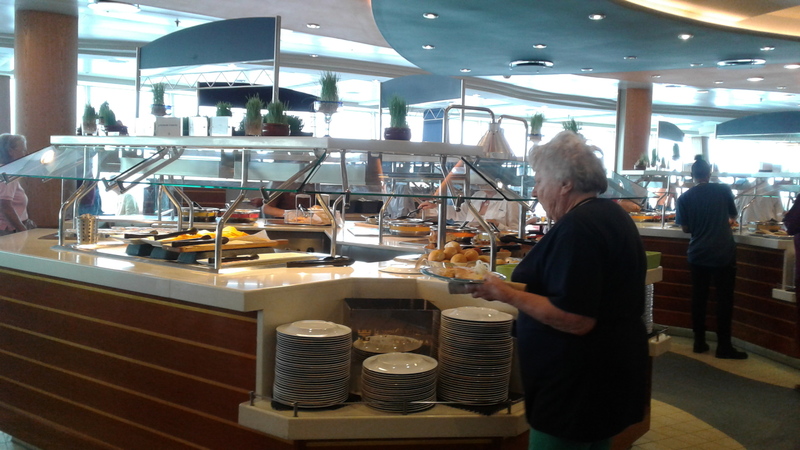 The dreaded buffet always has a salad bar, fresh fruit, and many other healthy choices, along with many unhealthy choices. If you can bypass the bread and the desserts, it will make it so much easier. I know…I can’t either. Especially on chocolate buffet day. In the main dining room, they always have salads on the appetizer menu. They will usually have a vegetarian choice for the main dish, and you can usually get chicken and/or fish. You can get cooked veggies, along with other healthy choices. You can bypass the bread and sweets and get fresh fruit for dessert or skip dessert altogether. Once again…I know…it isn’t easy. This is where the willpower comes in. There will be food in other unexpected places also that you need to avoid if you’re serious about eating healthy on a ship. There’s usually a 24 hour pizza place or deli. You’ll want to find out where that is and avoid it. And then you need to forget that there is frozen custard near the pool deck. And don’t forget that alcohol and mixed drinks will add a ton of empty calories to your cruise diet. You may have to do a few more minutes on the treadmill afterwards to make up for it. As for me, forget this entire blog and anything that I said! I will get on the ship intending to go to the gym, but I won’t. I’ll go on the ship intending to avoid sweets, but I won’t. I’ll go on the ship intending to avoid carbs, but I won’t. But what I will do is limit the amount of sweets and carbs that I eat, and I’ll use the stairs as much as I can. I don’t really drink much during a cruise, maybe one drink. I can limit the amount of pounds that I put on to maybe 3 or 4, and then after the cruise I’ll do better. I’d rather do without after the cruise than on the cruise. How about you? What do you do to keep in shape and not gain weight on a cruise? Or do you just forget about it and enjoy the cruise any way that you want to? But above all, a cruise is meant to be enjoyed! All those smiles are sure to burn some calories. Have fun. 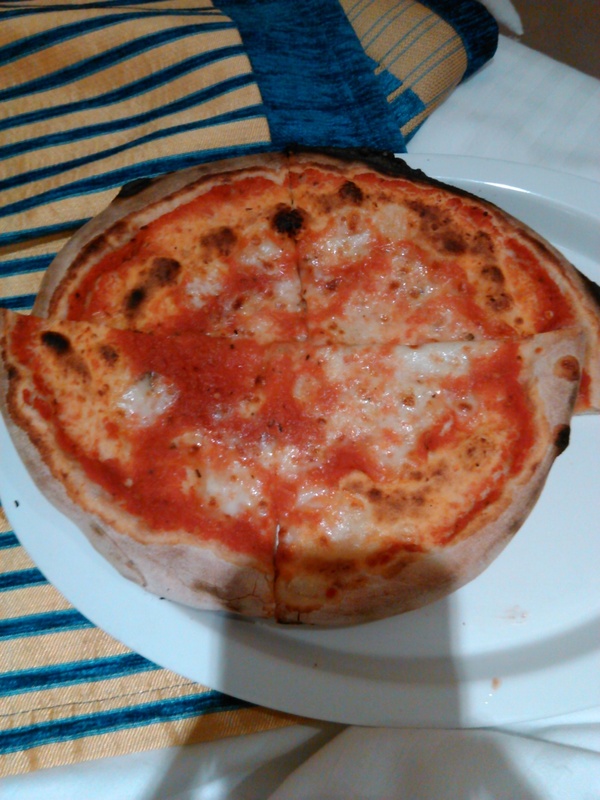 This entry was posted in cruising and tagged addicted to cruising, Caribbean, Carnival, cruise blog, cruise port, cruiseblog, cruising, gain weight, hsp, introvert, quietcruiser, ship on August 23, 2018 by The Quiet Cruiser.